Although largely focused on domestic policy issues, the ACU has a long track record of supporting militarist foreign and defense policies. During the Cold War, ACU participated in a number of hardline advocacy efforts as a member of the Coalition for Peace through Strength and actively supported rightist groups in Latin America and elsewhere, including the Nicaraguan Contras. Although some of its members were initially unenthusiastic over the George W. Bush administration's decision to invade Iraq after the 9/11 terrorist attacks, the organization was generally supportive of the administration's "war on terror." After a Pentagon-sponsored visit to Iraq in late 2003, ACU Vice Chairman Donald Devine wrote an op-ed for the Washington Times in which he assured readers that the war was soon coming to an end. He wrote: "I had been opposed to United States ground forces in Iraq but was impressed that Secretary Donald Rumsfeld had insisted that the number of American troops on the ground be limited—only enough to win the war but not so many to become bogged down afterwards. … But, with the pressure from influential U.S. voices to increase troop levels substantially and to remain indefinitely until a functioning democracy could be created, I signed up for the rigors of the trip to the combat zone to learn whether the secretary's message had reached the troops. The news from Iraq is good. The end of the U.S. occupation is in sight and the military and civilian leaders are moving enthusiastically and rationally to implement the plan." AUC’s activities focus on organizing the annual Conservative Political Action Conference (CPAC), which it claims is the “nation’s largest gathering of conservatives,” and producing “congressional ratings” that measure how “conservative” members of Congress are. AUC says its congressional ratings measure the stances of elected officials on “taxes, wasteful government spending, cultural issues, defense and foreign policy.” Among the members of Congress who have received the “100% conservative” score from AUC are 2016 Republican presidential candidates Sens. Ted Cruz (R-TX) and Marco Rubio (R-FL). AUC has reportedly received funding from companies in the arms, oil, and cigarettes industries. A 2014 Salon report highlighted the tens of thousands of dollars AUC has received from the National Rifle Association, the Koch brothers’ energy companies, as well as the cigarette company Altria. Since the election of President Barack Obama, the group has focused mainly on domestic policy, including efforts to push the Republican Party further right and contest Obama's health care initiative and economic bailout program. A highlight of the 2009 annual Conservative Political Action Conference, held shortly after President Obama's inauguration, was right-wing radio pundit Rush Limbaugh's declaration that he hoped the new president would "fail." The audience gave Limbaugh loud ovations after he stated: "This notion that I want the president to fail, this shows you the problem we've got. This is nothing more than common sense. … [Democrats] hoped George Bush failed. So what is so strange about being honest and saying I want Barack Obama to fail if his mission is to restructure and reform this country so that capitalism and individual liberty are not its foundation?" The ACU's efforts to derail Obama administration initiatives, however, have had some controversial results. In mid-July 2009, Politico reported that the group was embroiled in an ethics controversy regarding an alleged "pay-to-play" scheme. Politico secured a letter from ACU to FedEx—then at loggerheads with UPS over Obama-supported regulatory reform—offering to provide lobbying services if the company paid $2-3 million. Shortly after FedEx declined the offer, ACU's Chairman David Keene contributed his name to a letter addressed to UPS, saying that he and his co-signatories sided with UPS on the issue. The affair, which Politico's Mike Allen called "black-and-white proof of the longtime Washington practice known as 'pay for play,'" was swiftly downplayed by the ACU. In a press release, the group's vice chairman, Dennis Whitfield, wrote, "David Keene's name was on a letter prepared by another organization. This was a personal decision on his part and he was not representing ACU at the time." ACU's board has included many influential right wing figures, including Jeffrey Bell, former head of the Manhattan Institute and a signatory of the neoconservative Project for the New American Century; hawkish former U.S. ambassador to the United Nations John Bolton; Morton Blackwell, a founding member of the secretive Council for National Policy; the NRA's Wayne LaPierre; Jesse Helms; Grover Norquist, Morton Blackwell; and L. Brent Bozell III. American Conservative Union, "Who we are," http://conservative.org/who-we-are/. Ralph Hallow, “Face of change at American Conservative Union: Matt Schlapp is ready to ruffle feathers,” The Washington Times, July 1, 2014,http://www.washingtontimes.com/news/2014/jul/1/face-of-change-at-american-conservative-union-matt/?page=all . See the IRC GroupWatch Profile: American Security Council, August 1989. Donald Devine, "Mission to Baghdad," Washington Times, November 12, 2003. The American Conservative Union, “What We Do,” http://conservative.org/what-we-do/. Red Dawn, “American Conservative Union Reveals Only Presidential Candidate With 100% Conservative Voting Record,” May 13, 2015,http://chicksontheright.com/blog/item/28843-american-conservative-union-reveals-only-presidential-candidate-with-100-conservative-voting-record. Katie Glueck, “American Conservative Union: Marco Rubio, Rand Paul perfect vote record,” Politico, February 21, 2013,http://www.politico.com/story/2013/02/american-conservative-union-marco-rubio-rand-paul-perfect-vote-record-87918.html. Nicholas Confessore, “Lobbyists Fighting Spending Cuts Find Ally in Group That Often Backs Them,” The New York Times, April 9, 2013,http://www.nytimes.com/2013/04/10/us/politics/american-conservative-union-fighting-spending-cuts.html?_r=0. Eli Clifton, “Why CPAC Isn’t As Grassroots As You Think,” Slate, March 6, 2014,http://www.slate.com/articles/news_and_politics/politics/2014/03/cpac_supported_by_gun_oil_and_cigarette_industries_american_conservative.html. Sam Stein, "Rush Limbaugh At CPAC: Doubles Down On Wanting Obama To Fail (VIDEO)," Huffington Post, March 31, 2009,http://www.huffingtonpost.com/2009/02/28/rush-limbaugh-at-cpac-dou_n_170792.html. Mike Allen, "Exclusive: Conservative group offers support for $2M," Politico, July 17, 2009, http://www.politico.com/news/stories/0709/25072.html. 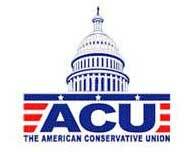 American Conservative Union, "Statement from ACU regarding false headline by Washington publication POLITICO," ACU press release, July 17, 2009,https://web.archive.org/web/20090722155809/http://www.conservative.org/pressroom/2008/StatementfromACU.asp. For a list of current board members, see "ACU: Officers, Executive Staff, and Board of Directors,”https://web.archive.org/web/20090202092759/http://conservative.org/about/directors.html. Whither Iran after the Likud-Kadima Union? Did Al Qaeda Succeed in Ending “the American Century”?